On Tuesday, President-elect Trump formally announced that he selected Rex Tillerson, the Exxon Mobil Chairman and CEO, to be Secretary of State. Trump tweeted early Tuesday morning that what he likes best about Tillerson as his pick for the nation’s top diplomat “is that he has vast experience at dealing successfully with all types of foreign governments.” The 64-year-old business man has gained a reputation of building strong relations with foreign leaders while negotiating deals around the world as an oil tycoon for over 40 years. Tillerson accepted Trump’s appointment in a statement on Tuesday. Tillerson has built a working relationship with Russia and Vladimir Putin which is a plus for Trump who has praised Putin as a strong leader. Mitt Romney, who was one of the leading candidates for Secretary of State before Tillerson was chosen, has been strong in his criticism for Russia, famously calling them America’s “number one geopolitical foe” during his 2012 Presidential campaign. As Secretary of State, Tillerson’s attitude towards Russia is much more inline with Trump’s stance on the world’s largest nation. 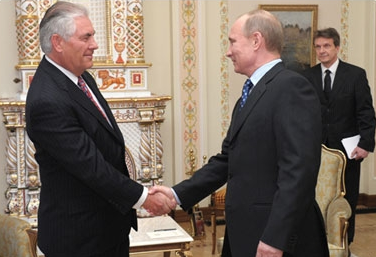 Exxon CEO Rex Tillerson with Russian President Vladimir Putin. Romney posted on Facebook late Monday night, saying he was honored to have been considered for the position. On Tuesday, the State Department released a statement from John Kerry offering a congratulations for the man that would hold his position next.